Monrovia, Liberia. January 16, 2012 was neither a day to look back with regret or anger nor to look forward with anxiety or doubt. Rather it was a day to rejoice and celebrate. At 11:00 am President Ellen Johnson Sirleaf, Africa’s first – and until now only – democratically elected woman president, was inaugurated for a second six-year term. By the time the 73-year old ‘Iron Lady’ will have completed her second term, in 2018, she will be Liberia’s longest-serving President since 1971. In 1971 the country’s longest-ruling President ever, William Tubman, died. He ruled for 27 years and laid the basis for a modern economy. His successor, William Tolbert, was brutally murdered in a bloody coup d’état staged by enlisted men of the Liberian Army led by master-sergeant Samuel Doe (1980). President Doe – who became Liberia’s first president of tribal descent – was savagely murdered too, in 1990. Two extremely violent civil wars followed. At least 200,000 Liberians lost their lives, many more were wounded and traumatized. The wars resulted in at least one million displaced people and wrecked the modern economy. In 2003, Liberia’s president, dictator and former warlord Charles Taylor, was arrested on charges of war crimes and human rights violations in Sierra Leone and handed over to the Special Court for Sierra Leone. At present, Taylor awaits his verdict in The Hague which is due soon. In 2005 Ellen Johnson Sirleaf defeated in the second round of the presidential elections soccer star George Weah and thus became Africa’s first democratically elected female president. In November last year she again won the elections in a second round which was boycotted by the main opposition party led by Winston Tubman, nephew of the former president, and George Weah. On the eve of Sirleaf’s inauguration they both made a U-turn and accepted theit defeat and promised to co-operate with the new Administration. As a World Bank expert and Harvard educated economist, President Sirleaf’s experience and international network helped her with numerous achievements during her first mandate: cancellation of the country’s staggering US$ 4 billion debt, successfully negotiating foreign direct investments in the agricultural and mining sectors totalling over US$ 13 billion, and maintaining a fragile peace – aided by a United Nations-led military mission in Liberia, UNMIL. However, Liberia and Madame President Ellen Johnson Sirleaf face numerous challenges. UNMIL’s US$ 524 million budget for 2010/2011 exceeded that of the Liberian Government for the same period. Yet, it even was worse a few years earlier. When President Sirleaf took office, in 2006, the national budget amounted to only US$ 80 million (yes indeed, eighty millions US dollars). 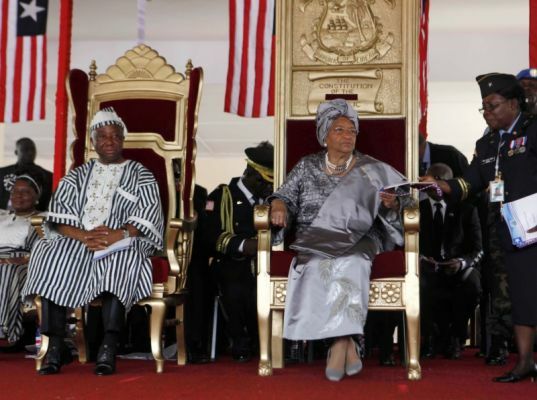 Over the years, Sirleaf has managed to substantially raise the budget and the Liberian Legislature voted a US$ 550 million budget for FY 2011/2011. Not much for a country of 3 million people and a war-wrecked economy. Fortunately, President Sirleaf’s international reputation has resulted in Liberia being one of the world’s most popular donor darlings. International aid to Liberia was estimated at about US$ 1 billion in 2010, including UNMIL. Liberia’s problems are numerous: unemployment, illiteracy, corruption, lack of infrastructure, a poor health situation. Perhaps even more important are the need for National Reconciliation – Liberians still struggle with the emotional consequences of the civil wars – and National Unification, a legacy from former times, going back as far as the country’s creation in 1847 by freed slaves and free-born blacks from the United States – who liked to call themselves Americo-Liberians – and whose descendents ruled Africa’s first republic without any power-sharing with the tribal population until 1980. Ellen Johnson Sirleaf is well placed to handle these problems though alone she will not be able to overcome them. As the granddaughter of a Gola chief and raised in an Americo-Liberian family she may make a difference. Internationally she is admired, she won the 2011 Nobel Peace Prize. At home she can boast of impressive achievements though her star has started fading in recent years culminating in political tension and even deadly violence during the November elections. In her Inaugural Address she promised to work for jobs, to give Liberia’s youth the skills they need to prosper, and to fight graft. Liberia’s political stability and economic progress depend on jobs, jobs and jobs. Lacking the funds needed to finance the necessary investments, the country can’t move forward without foreign investors and donors. Without UNMIL, internal peace is fragile and not guaranteed. As one of my Liberians friends told me: We need foreign funds to develop and foreign troops to keep the peace. During the Tubman Administration (1944-1971), Liberia experienced an economic boom, with a double digit growth rate. Yet, it was Growth without Development, as a Northwestern University team labelled Liberia’s economic success story. Today, with Ellen Johnson Sirleaf on the steering wheel, Liberia has the potential to do better. Already, the country is experiencing an impressive economic growth rate – which though should not surprise as the country comes from far. National unification and reconciliation are among Liberia’s top priorities. This means power-sharing, equal opportunities for all Liberians, and justice for all. Economic justice, as President Sirleaf calls it, seems to be as important: job creation, education & training, notably for Liberia’s youth, and the fight against corruption. There is a time for celebrations, there is a time for hard work. The party is over. The time to work hard has come. This entry was posted in Charles Taylor, Civil War(s) Liberia, Debt relief, Elections in Liberia, Ellen Johnson Sirleaf, George Weah, Joseph Boakai, Liberia, Liberian History, Nobel Peace Prize, Samuel Kanyon Doe, William R. Tolbert Jr., William V.S. Tubman, Winston Tubman. Bookmark the permalink.